UT353 portable digital sound meter can convert ambient sound into electric signal and process data. It has compact design and easy to operate with user friendly interface. Bluetooth function is added for data transfer and analysis on mobile App. LCD screen, easy to read, noise measurement is 30-130dB. Changeable sampling rate, fast is 125ms, slow is 1s. 1/2 inch condenser microphone. Can convert ambient sound into electric signal and process data. Compact size, easy to carry. LCD BACKLIGHT: This sound level meter has digital LCD screen,easy to read, noise measurement is 30-130dB. BLUETOOTH FUNCTION AND DATA HOLD: Bluetooth function is added for data transfer and analysis on mobile App. 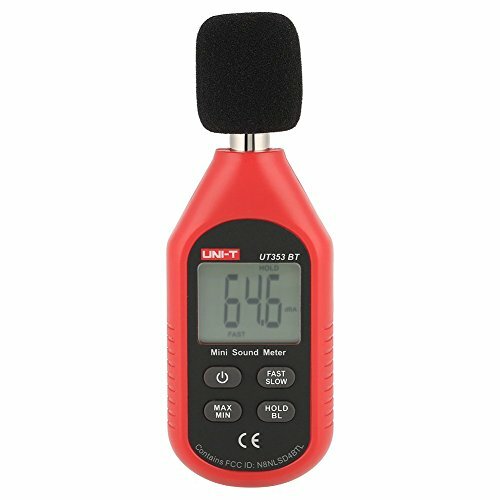 USEFUL TOOL IN YOUR WORK & LIFE:UT353 portable digital sound meter can convert ambient sound into electric signal and process data. It has compact design and easy to operate with user friendly interface. AUTO POWER OFF:This sound level meter with the function of auto power off ，safety for you and your family. EASY TO CARRY :Compact size, easy to carry.